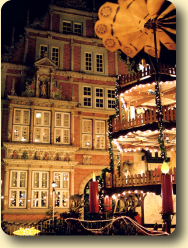 Due to the historic background, the Hamelin Christmas Market can truly be described as a genuine Fairy Tale Market. 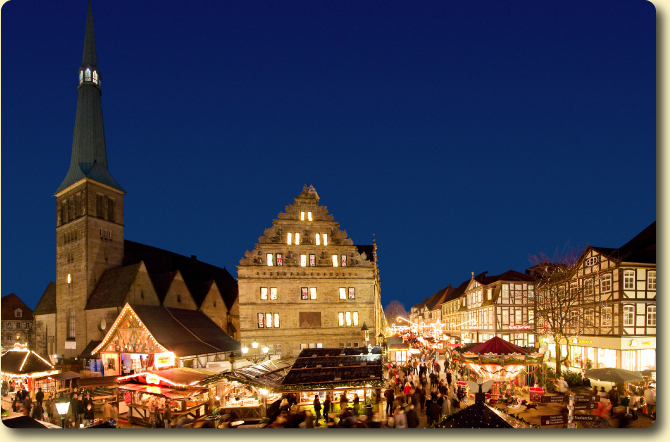 The Hamelin Christmas Market features over 70 festively decorated wooden huts; all clustered around the Wedding House, the Market Church and around the picturesque old quarter with it’s lovingly restored timber-framed houses and grand Weser Renaissance buildings. Highlights of Hamelin's Christmas market are; the Nativity scene, which has real animals to stroke, a Christmas pyramid at only a mere 11 metres tall and a massive advents calendar on the Hochzeitshaus (Wedding House). 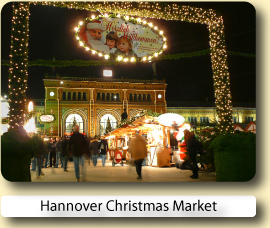 A recommended guided walk of Hamelin explores all the historic highlights and its beautiful Christmas Market. 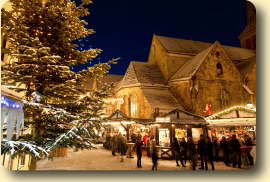 The 90 minute walk gives an in depth guide to German Christmas customs and traditions and finishes with a well deserved free hot drink of mulled wine. This tour can be booked, for only €10 per person, with the local Hamelin tourist information office. 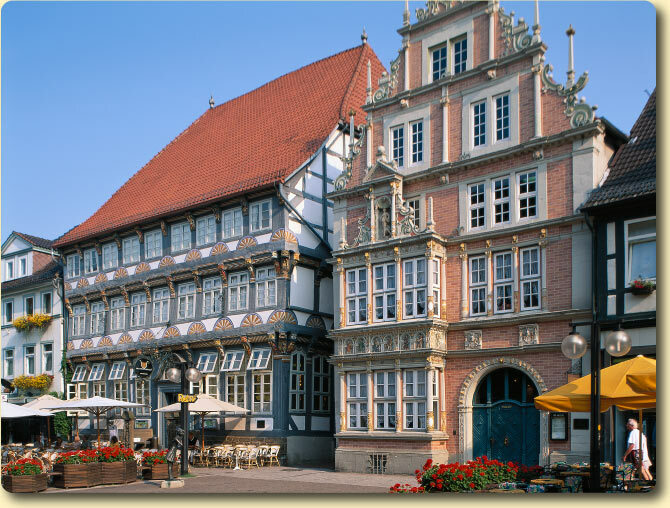 In German the town of Hamelin is known as Hameln. The town is located only 45 minutes from Hannover city centre and is well served by twice-hourly S-Bahn services during the day . Hamelin is a beautiful and enchanting little town in the very heart of the Weser Mountains Nature Park, the mountains being called after the same river which flows through the town of Hamelin. The river Weser is where most of the fairy tales we know today where inspired by the Brothers Grimm, including in Hamelin, which is primarily famous for the legend of the Pied Piper. Due to the importance of the Weser river, Hamelin's fortunes were made in medieval times and as a result many successful businessmen showed off their wealth by building some incredible buildings with beautiful and complex decorations. Today the crown of the Weser Renaissance can still be admired, especially in the town centre which has a great concentration of colourful historical buildings, all bustling with vibrant activities and life. In Hamelin - which could very much resemble an open air museum - the magically fancy gables and artistic construction draw groups of tourists as magnetically as the Piper's flute, as is the Glockenspiel and Clockwork Figures which may be seen three times a day (1:05pm, 3:35pm, and 5:35pm). More mysteries can be discovered at the Pied Piper and Hamelin town museum. Other attractions worth visiting in the area are the Haemelschenburg Castle, the Hamelin Glassworks or a relaxing riverboat excursion along the Weser valley, one of the loveliest and best ways to see its fairy tale landscape. A modern build hotel conveniently located next to a lovely small park and the old town centre. Rooms normal hotel fare, very clean, and most with a small balcony. Food is good, a varied breakfast buffet. 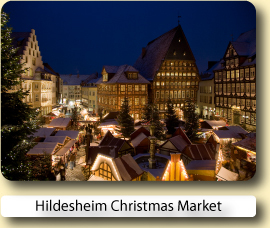 Book your hotel for the Hamelin Christmas Market with Expedia or Hotels.com.Both online reservation services will let you compare and book hotels at great low prices.